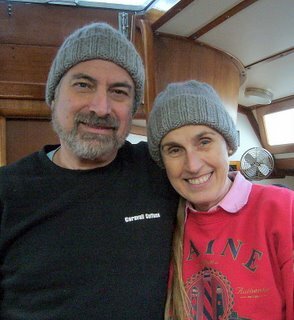 Our friends Michael and Nancy spent the last 16 years sailing around the world. They and their boat returned to Tacoma just in time for rain, snow and ice. Fortunately, their boat is warm and cozy. Nevertheless, a warm hat is always welcome. These hats are made from Lamb's Pride Bulky on US9 needles. Michael and Nancy are the kind of people who will like the hats even more because the yarn came from a thrift store. It's snowing again, maybe another 2 inches to 3 inches of snow so far. M&N, you're not in the South Pacific any more.